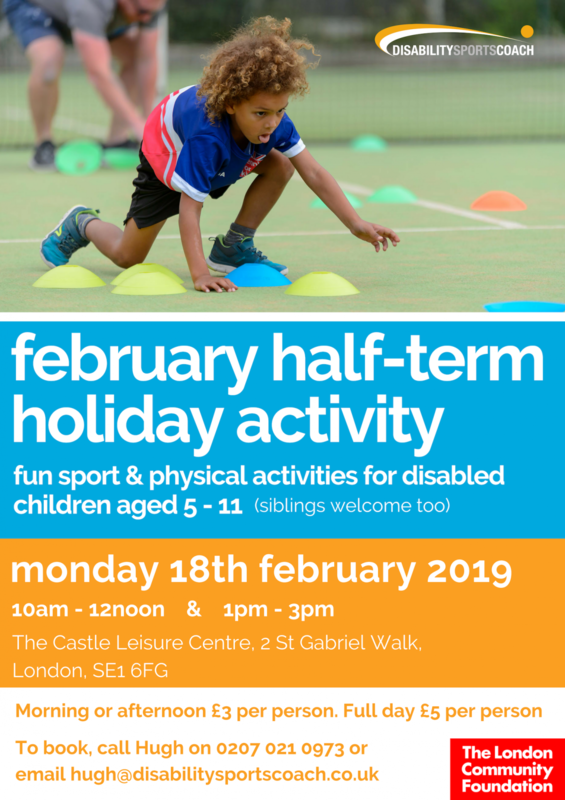 We have organised a one-day sport and physical activity camp on Monday 18th February for disabled children from 5 to 11 years old and their siblings. The camp will take place using the excellent indoor facilities at The Castle Leisure Centre, 1 St Gabriel Walk, Elephant & Castle, London, SE1 6FG which is easily accessed by public transport. Lots of fun activities will be available which will be run by our experienced sports coaches. Sessions can either be booked from 10am - 12noon (£3) or 10am - 3pm (£5). The camp has been made possible with generous support from the London Community Foundation. For more details please contact Hugh Elsegood on 07772 677259 or email hugh@disabilitysportscoach.co.uk.